Ancient History – The Brew Band! Sample of the last Album! If the Levellers were moonshine-swigging Appalachian mountain folk instead of Guinness-swilling Brighton crusties, they would probably have sounded a lot like this. The sheer energy and passion that pours from the band is matched only by their musical ability, and the songs themselves are the kind of short infectious pieces that grab you by the throat and demand that you move, without you really noticing. The twin melodies of violin and guitar swirl and twirl in and around each other with a grace that defies the relentless stomp of the bass and drums, while the acoustic and vocals work mercilessly away at your subconscious, making sure that the material haunts you for days. This is music MADE for festivals. …a very tight, rocky band, with only the tattered remnants of Irish and Old Timey fiddle tunes hanging out of the back of it (definitely no classicised folky pretty stuff). It’s old and tough and dirty and rough. Next up were Billy In The Lowground who performed in the Yellow Tent and provided some much needed folk-rock, Levellers-esque dancing fun, every festival could do with more of this kind of vibe! 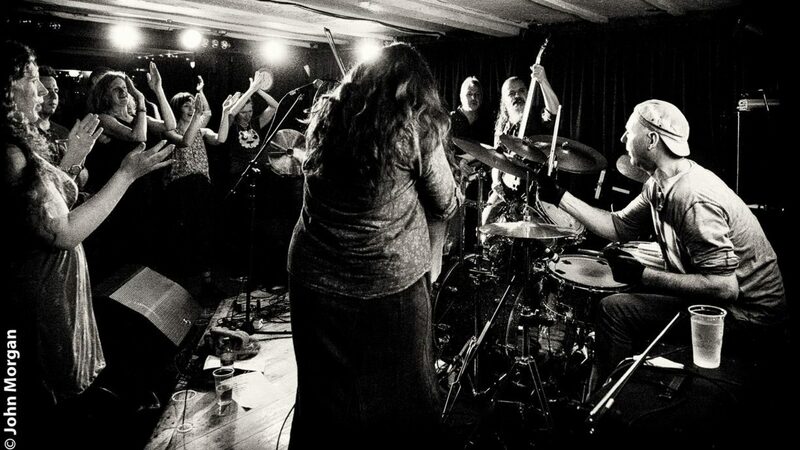 Billy in the Lowground are a loud, energetic and entirely authentic fusion of folk and rock. Proper foot-stomping performances playing with real heart make it hard not to dance. Beese’s has one criterion for picking the headline band: will they get people up and dancing within thirty seconds? Billy in the Lowground passed! …the soundtrack of hell raising festival folk tunes, to back room bawling and bar room brawling, of escaping to brighter futures, the familiarity of the world you know or just a damned good night out. If Nashville were in Somerset, Billy In The Lowground would be one of its leading lights. So let’s raise a glass of cider (with a bourbon chaser for good measure) to the Nashtonbury scene, it may only contain one band, but it’s a start, right? What makes Billy in the Lowground more accomplished than many other Folk-Rock bands is the quality of the songwriting, the exuberance of the arrangements and the skill and enthusiasm of the playing. Ruth Behan’s fiddle has a defiantly Irish sound that roots the rest of the band and underpins the Country feel to many of Chris Hibberd’s songs. This is Nashville relocated to the wilds of Somerset and performed with Joe Strummer’s heart and soul.